A friend mentioned making sugo di carne -- a rich dish of beef braised in chianti and espresso -- for Christmas, and I was immediately obsessed. What a perfect combination! The main dish was set for our New Year's Day celebration. Anna would contribute caponata, another friend would bring tiramisu. And then on New Year's Eve, my husband asked: What are the children going to eat? Good question. 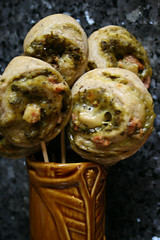 Pizza lollipops to the rescue! Fast, easy, and foolproof, and vaguely in keeping with the Italian menu. I haven't scientifically tested this theory, but I'm pretty sure my kids will eat almost anything on a stick. Their school lunches often include toothpick kabobs with chunks of fruit, bits of cheese and deli meat, or vegetables. Our only flat-out failure was packing a sandwich-on-a-stick with sliced turkey and cheese wrapped around a pickle -- way too slimy by lunch time. One of our greatest successes, however, has been pizza on a stick. I can't claim credit for the idea: There are quite a few variations floating around the Internet, many involving wrapping strips of dough around a skewer of meat and/or vegetables. The one I like best right now comes from Artisan Bread in Five Minutes a Day. You could use any homemade pizza dough, and I would think these would work fine with refrigerated pizza dough. I insert lollipop sticks for packing these in lunch bags, or I skip the sticks and pack them as pizza wheels. With just a handful of sticks left, I used bamboo skewers for our gathering. The pizzas swiftly disappeared, and then we had to disarm six kids. I strongly recommend using lollipop sticks with young kids, or forgoing the sticks completely and serving these as pizza wheels or pizza buns. We made two versions for Friday's dinner. One was simply dressed with tomato sauce with mozzarella and cheddar. For the second, I used homemade, nut-free sun-dried tomato pesto (thawed from the freezer) with lemon and cilantro poultry sausage, mozzarella, and parmigiano reggiano cheese. Both flavors were devoured at an equal rate, so it's safe to say you can make these as simple or fancy as you'd like. If you're trying to sneak in vegetables, this is an easy way to do it. Here are the simple instructions -- no measurements, because you should be able to wing it. You can easily freeze the slices, before or after baking. You also can wrap and refrigerate the log a few days before slicing and baking. Adapted from Artisan Bread in Five Minutes a Day. Preheat the oven to 375 degrees. Prepare two baking sheets: For homemade dough, use parchment paper or a sprinkling of cornmeal; for refrigerated pizza crust, use non-stick spray. 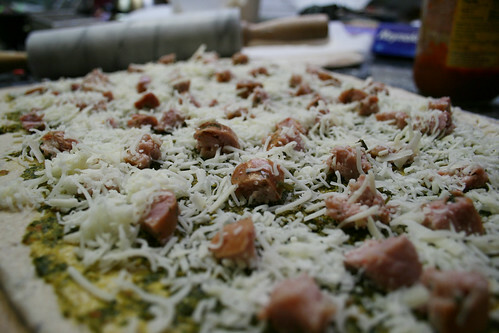 Roll your pizza dough into a 1/4-inch-thick rectangle. Spread with sauce. If you're using toppings, add a thin layer. Don't make it too thick or the rolls may fall apart. Finally, top it all with a good amount of shredded cheese. 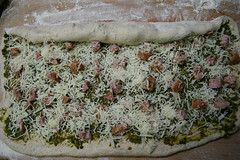 Starting at the long end of the rectangle, carefully roll the dough into a log and pinch the seams closed. Be careful to roll firmly; I tend to roll it too loosely and have to pinch things back together when I lay out the slices. Using kitchen scissors, cut 3/4-inch slices from the pizza log and set the slices onto the baking sheet. Leave plenty of room between them; I fit six to eight on one sheet. Brush the edges lightly with olive oil. Refrigerated crust could go straight into the oven; homemade dough should rest for 15 minutes, if you have time and patient kids. Bake for 10 to 15 minutes until dough is puffed and cheese is melted and smells delicious. Remove from baking sheet and insert sticks. Serve as-is or with a small bowl of pizza sauce for dipping. I've never seen them on a stick before. Wow!